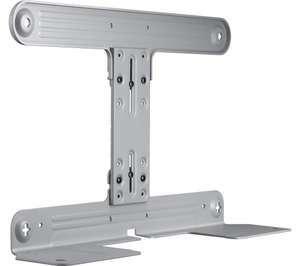 For a simplistic and minimalist look, the Samsung WMN-300SB/XU One Mount Kit lets you mount your 400 x 400 VESA Samsung TV and Samsung All-in-One Sound Bar to the wall. The supplied One Cable lets you power your matching Samsung TV and sound bar from a single plug socket for a clean, neat finish. 1st deal nine years after I joined.... is that a record? Samsung Soundbars (Sound+ series): The WM300SB is compatible with select model Samsung soundbar speakers (Sound+ series only) - including the HW-MS650, HW-MS6500, and HW-MS750. The soundbar rests on the lower bracket of the WM300SB, while screws secure the soundbar in place from the back and bottom of the bracket. Deal posting newbie! This is hang-glider first deal post. Help out by leaving a posting tip or just to show your appreciation for their contribution.